Canton Museum of Art presents the “panoramic adventure” in African Menagerie: The Inquisition. This touring exhibit allows audiences to discover and explore the plight of African wildlife species. 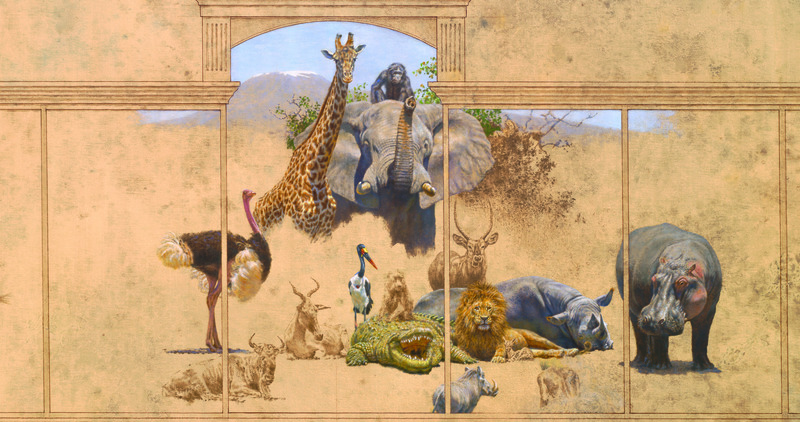 Featured is celebrated American artist, Brian Jarvi, whose works have won numerous awards from national and international animal conservation agencies, including the Safari Club’s International Artist of the Year. In both museums and galleries, he is considered one of the world’s premier painters of wildlife. Central to this exhibit are seven, visually interlocking panels, more than 36 ft. in length, including a ten-foot by five-foot centerpiece; plus over 40 related research sketches and mixed media studies. The works help call attention to Earth’s wildlife extinction crisis. From the jungles around the equator where mountain gorillas and chimpanzees barely endure, southward to the Serengeti Plain, Kalahari Desert, and the grasslands of Zimbabwe, the animals whose very iconic presence has become a symbol of wildness to all of us are dwindling at alarming rates. African Menagerie uses the power of art to address this global concern. Brian Jarvi's AFRICAN MENAGERIE Tour Produced by David J. Wagner, L.L.C.